My name is Rafal Sietnik, I live in Wroclaw, Poland and I work as an IT specialist. I have always been interested in CG but I've never give it a try for longer time than a month. My activity was usually reduced to browsing forums and admiring others works. I remember that when I was a teenager I dreamed about Amiga with Real 3D or Lightwave. About 6-7 years ago, I tried to get started with Blender but because of a permanent lack of spare time, I've only made few models, nothing else. Earlier this year, I felt that watching is not enough anymore and since March I'm learning Blender again and this has been a quite good fun. 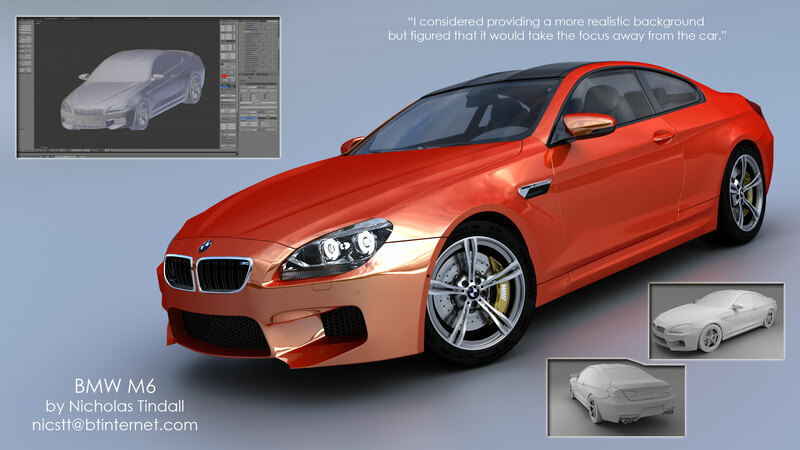 I began with car modeling and this is the first model I've made. I didn't want to choose a modern car for my first modeling exercise in Blender so I've started to browse the internet looking for some interesting old car. I think I've chosen Alfa Romeo because I own one. I've finished this model in about 2-3 evenings, rendered it in studio environment and forgot about it, then last week I've decided to work on it again and this is the result. 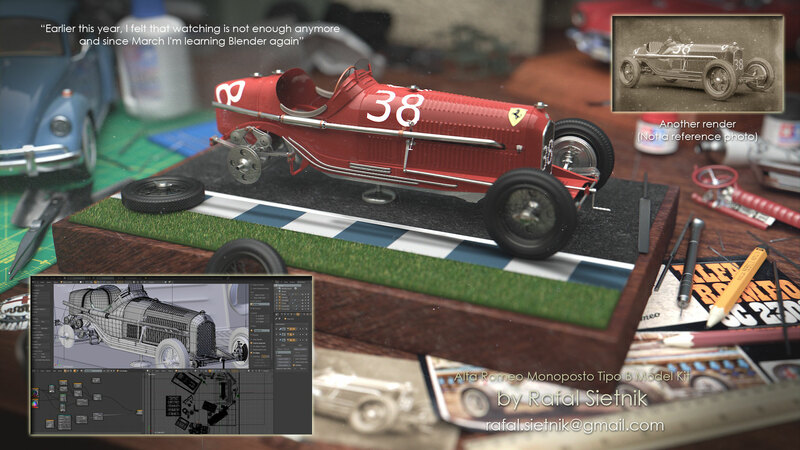 It's hard to find such a car somewhere on the street so I've came to the conclusion that it will look nice and real as a diecast/model kit and taken as a macro photography so I put it on the desk and surrounded it with other cars models I've made in Blender since March. It was rendered in Cycles, 1000 passes, with a sky texture and one poly light. The render took about 4 hours 40 minutes to complete in 1920x1080 resolution on my i5-520/4GB notebook. All postprocessing was done in Blender Compositor. I am currently working on my skills so as to enable me to illustrate a children's story; I find the idea of using 3D images instead of more traditional methods appealing, as well as offering the opportunity to try and get a different look to the art. I considered providing a more realistic background but figured that it would take the focus away from the car. My name is Emanuele and I'm from Italy. Out of my interests in 3D graphics I started learning 3D graphics in 1998 with Corel Dream 3D. 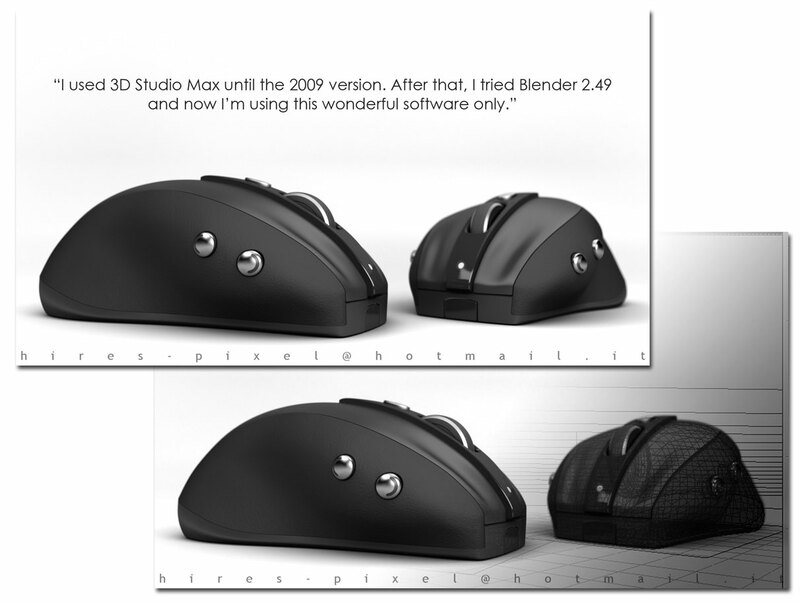 Then i discovered 3D Studio Max 3 and I used it until the 2009 version. After that, I tried Blender 2.49 and now I'm use this wonderful software only.